Blake said, 'How do you know?' I sat for him said the Voice. 'I am the Archangel Gabriel.'" The halo in art, like the wings, is another instantly recognizable feature of angels, denoting holiness. It's alternatively referred to as a niumbus or aureole. Intriguingly, haloes tend to divide into two seperate kinds. 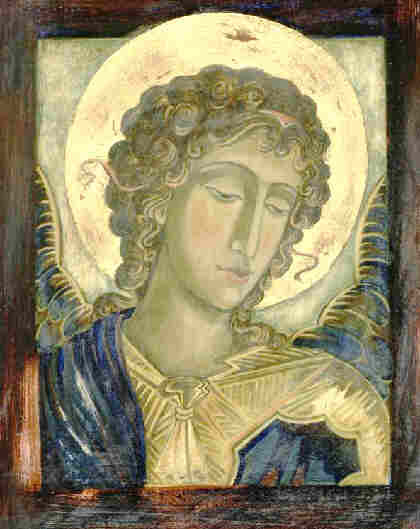 First, there are those that form an unchanging circular background to the head, which doesn't move even when the head is turned to a profile view: in other words, the halo is presented to the viewer rather than being an intrinsic part of the angel's anatomy. The problem faced by artists who took this approach was that haloed figures with their backs to the viewer appear to have their vision blocked by their own haloes- as in Giotto's Last Supper, painted at the beginning of the 14th C. But in later paintings the halo is often attached to the back of the head as an angled disk, like a hat, and we see it differently (and usually in a na pproximate perspective) depending on which way the angel is looking. There are variations too in the size and importance of the halo. It can be quite skimpy, like a wisp of light, hardly noticeable at all. Sometimes, though, it appears as a single or double transparent gold circlet either behind or above the head, owing it impact more the intensity of the gold than to any formal qualities. Or it can be absent altogether. In some paintings, howeer, the angelic halo seems almost solid like a gold medallion, and indeed it may have an emobossed appearance, perhaps with a coin-lie milled or studded edge. A holy text may be shown within the halo, and the gold may match gold trimmings at the hem of the costume.